Image courtesy: Giridhar Appaji Nag Y. This city has major significance to the tourism in Punjab. 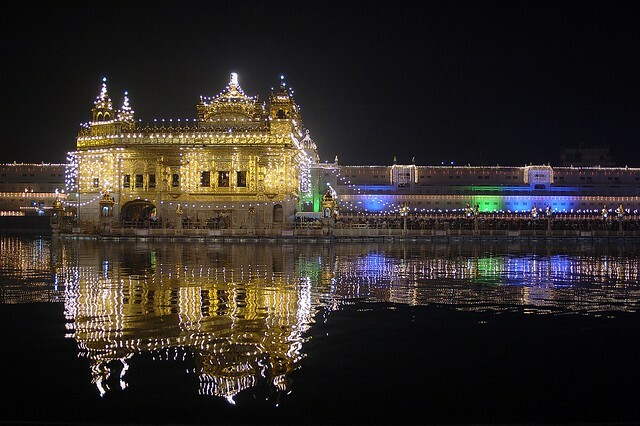 The city houses Harmandir Sahib Gurudwara which is also referred to as Golden Temple. It is the holiest Gurudwara in the state of Punjab. Other important tourist attractions include: Jallianwala Bagh, Akal Takht, Tara Taran Sahib, Wagah Border, Maharaja Ranjit Singh Museum and Durgiana Temple. Chandigarh- the shared Capital of states of Punjab and Haryana, is among the best planned cities in India. It is a beautiful city that is famous for the modernized buildings but the natural beauty is intact in Chandigarh. It is heart of Punjab and has various attractive places like Rock Garden, Rose garden, Sukhna Lake, Timber Trail and Mahendra Chaudhary Zoological Park. You can simply recall it as the land of modernized parks. Jalandhar is amongst the ancient inhabited major city in Punjab. You must pay a visit to this city to know and feel the true culture of Punjab. The city has a lot of historic as well as religious tourist places such as Imam Nasir Masjid, Shaheed-E-Azam Sardar Bhagat Singh Museum, Devi Talab Mandir, Wonderland Theme Park, Rangla Punjab Haveli and Prithvi’s Planet etc. Ludhiana is amongst one of the most famous tourist places in the state of Punjab. It offers numerous tourists activities. Ludhiana is an old city with various ancient locations and Gurudwaras and shrines. The serenity at Gurudwaras will give you peace from inside. Some popular attractions are: Nehru Rose Garden, Lodhi Fort, Hardy’s World Amusement Park, Rural Museum and Tiger Safari Zoo in Amaltas etc. Patiala is the preferred tourist destination in the state of Punjab. The most famous attraction in this city is Qila Mubarak that is spread over 10 acres area. This building is the perfect blend of Mughal and Rajasthani architectures. Sheesh Mahal is another worth visiting place in Patiala. Baradari Gardens, Gurdwara Dukh Niwaran Sahib, Bahadurgarh Fort and the Baradari Gardens are some other tourist attractions in Patiala. Known for its picturesque tourist attractions, Pathankot is the must visit place in Punjab. It is located at the foothills of Himalaya and is surrounded by Shivalik (mountain hills). The place offers serene views and has a gorgeous climate. It depicts the culture of Rajputs. There is a lot to do during the Pathankot trip. Bhatinda is one of the oldest cities in Punjab and has rich cultural as well as religious significance. It has the perfect blend of various religions and cultures. Bhatinda is home to ancient Gurudwaras, historical monuments and lakes. The city has the roots with heritage of various Indian cultures. It is considered to be 3000 years old city. Quila Mubarak is a famous monument in Bhatinda, do not get confused with the fort in Patiala with similar name! Kapurthala is also a famous city in the state of Punjab and it is also referred to as ‘The Paris of Punjab’. Nice climate and sightseeing locations are enough to give pleasant experience to the travelers. Jagatjit Palace, Moorish Mosque, Wonderland Theme Park, Radha Krishan Temple and Kanjli Wetland are few examples of top attractions in the city. There are more than 30 places that are worth visiting in Kapurthala. In British India, Kapurthala was the capital of princely state. Ropar is also called as Rupnagar and it is one of the important ancient towns in the state of Punjab. The town is located merely 50 KMs from Chandigarh so the tourists can visit both places in one go. Birdwatching, religious and historical places and sightseeing at lake are some popular activities in this town. Mohali, also known as Sahibzada Ajit Singh Nagar is the commercial hub. It is home to Punjab Cricket Association Stadium. The city has many tourist attractions such as Baba Banda Singh Bahadur War Memorial and memorial where the Fateh Burj is located. Other attractions include Gurdwara Amb Sahib, Mataur Lake and North Country Mall. To have a glimpse into the culture of Sikh community, the State of Punjab is the best place to visit. It has loads of points of interests for historical, cultural, sightseeing and religious tourism. Hope you like these places!